In this post, we’d like to draw your attention to the Mirasvit RMA extension. Although we’ve already described the most reliable RMA modules for both Magento 1 and Magento 2, and the Mirasvit’s solution is in both lists, it is necessary to create a separate overview to show how the tool works and looks from inside. 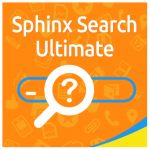 So, if you are looking for a powerful tool designed to simplify your daily routine related to managing returns and exchanges of goods, you’ve come to the right place. 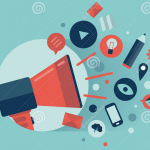 Below, we will tell you why Mirasvit RMA extension is important if you are going to create strong relationships with customers. With its intuitive interface, both admins and buyers will seamlessly leverage the return/exchange process. 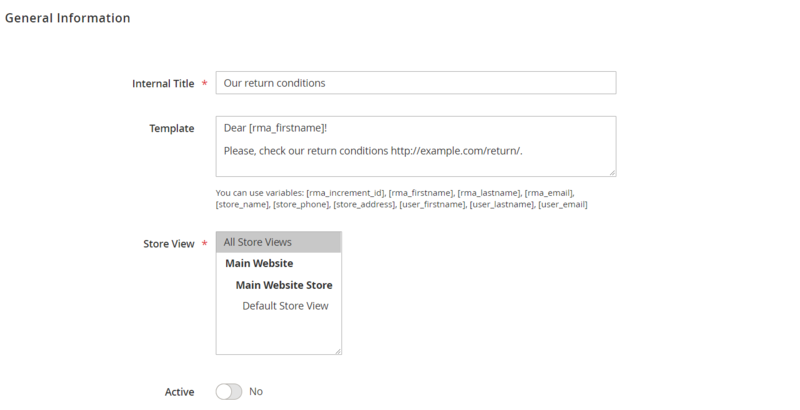 Since the Mirasvit RMA extension for Magento 2 and 1 has two types of user interfaces, first, we are going to describe how its backend works and then say a few words about the frontend part of the module. So, we can already affirm that Mirasvit RMA is a must have Magento tool since it takes care of both customers and administrators. On the main RMA screen, there is the RMA grid which contains the following columns: checkbox, RMA ID and #, Customer Name, Order #, Owner, Status, Created, Updated, Last Replied, Last Reply At, Exchange Order #, Tracking Code, Return Address, Items, Resolved, and Action. The grid supports mass actions (you can delete items in bulk, as well as mark them as read/unread and change status) and offers advanced filtering options for each column. Besides, you can add a new RMA by clicking on the Add New RMA button. Having clicked on the button, you proceed to the New RMA screen with a new grid containing orders. Choose an order to create a new RMA. 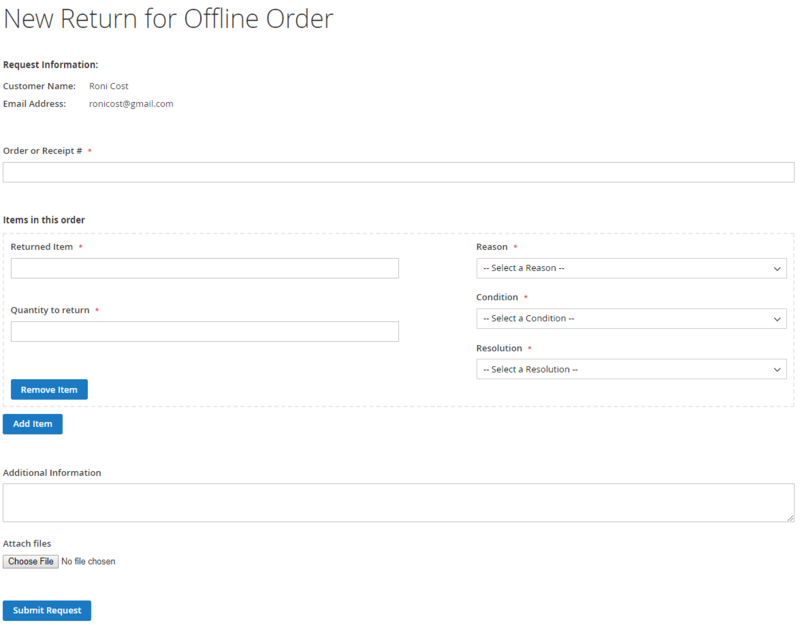 Now, you can specify all the necessary parameters for returning the order via 4 data sections: General Information, Additional Information, Contact Information, and Items. In General Information, you should set an RMA number (it will be generated automatically if you leave it empty), select an RMA owner and status, and upload a return label. The section also illustrates such information as customer name and return address, as well as other RMAs for this order (so you can easily avoid duplicating your RMAs). In Additional Information, you decide whether to provide a prepaid return label or not, select shipping carrier and shipping carrier for exchange, as well as specify tracking number and exchange tracking number. Note that this section contains custom fields which can be modified. As for the Contact Information section, it consists of such fields as First Name, Last Name, Company, Telephone, and Email. Below, there is the last section that contains returned products. It shows a product name, its SKU, price, and quantity. 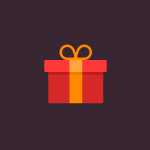 You can choose the number of items to return, select a reason, and specify item condition and resolution (e.g., Exchange, Refund, Store Credit). After all the forms are filled in, don’t forget to hit Save. If you click on an already existing RMA, there are two more sections: RMA History and Add Message. You can create both internal notes and messages to a customer, insert quick response, and attach files. Messages can be marked as unread. 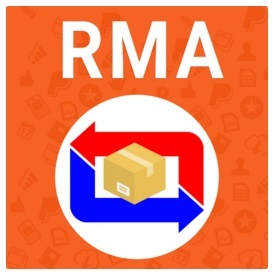 For each RMA, the following options are available: you can delete, reset, or print an RMA, as well as exchange order. – Memo Total where you can leave credit memo comments and view Credit Memo Totals parameters. Note that it is possible to notify a customer by email and make comments visible on the storefront. If you click on the Exchange Order link, a new screen appears where you can create a new order for the customer. Hit the Add Products button to choose new products for the exchange. Each new item can be either removed or placed to the cart. Besides, you can set a custom price, change the quantity, and apply coupon codes. Then, check the Account Information section. 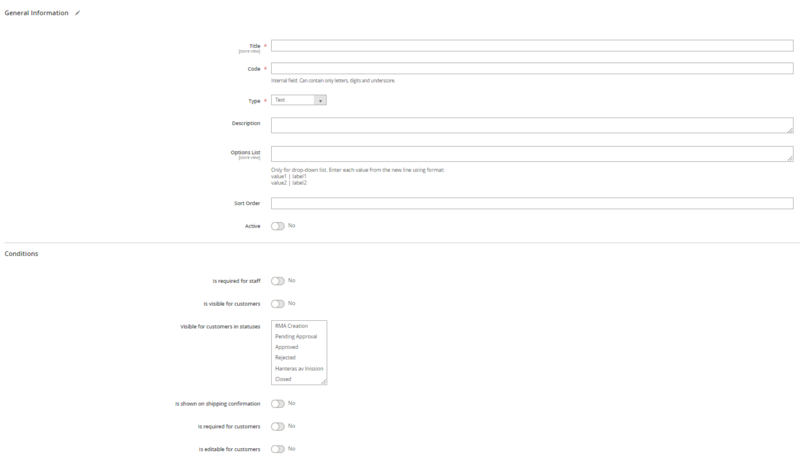 Here, you can change the existing customer group and specify a customer’s email. 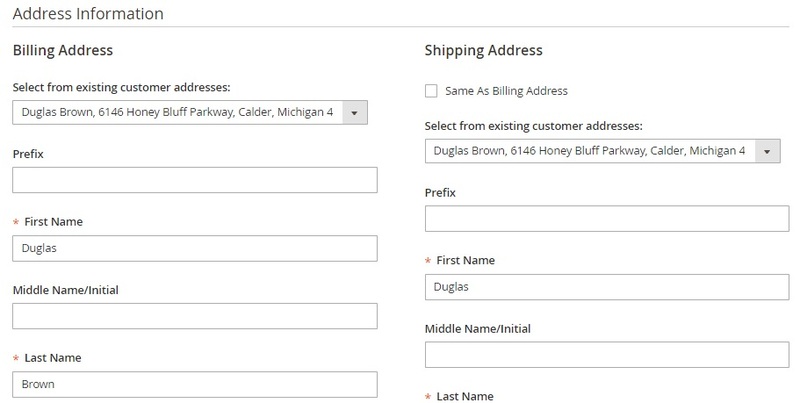 Next, there is the Address Information section with Billing and Shipping Addresses. You can Validate VAT numbers and save the filled in data in your address book. The Order Total section consists of Order History (you can place order comments here) and Order Totals (you can see Grand Total here). 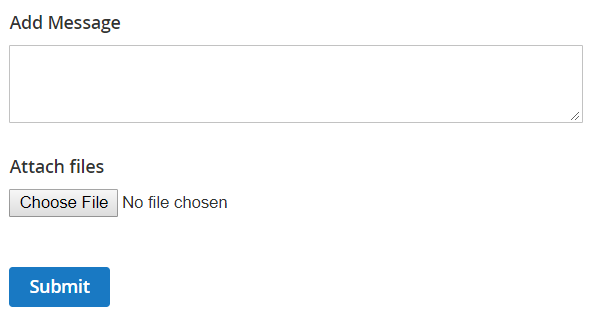 Besides, there are Append Comments and Email Order Confirmation checkboxes available at the bottom of the page. There is also a page that contains exchange reasons. You can apply mass actions in a grid, changing statuses or deleting reasons in bulk. It is also possible to add new reasons on this screen. Each reason screen has only three fields: Title, Sort Order, and Active (status). The same is about resolutions. By default, there is a grid with three resolutions. You can delete them or change their statuses in bulk, as well as add new ones. As for each resolution screen, it contains one more option – Code. The Quick Responses page is based on the same principles and supports the same mass actions. A new template requires the following data to be specified: internal title, template (you can use variables here), store views, and status. Each new status requires the following two sections of data to be filled in: General information and Notifications. In General Information, you should specify a title, code, sort order, status (active or inactive), and whether to show “Print RMA Packing Slip”, “Print RMA Shipping Label”, and “Confirm Shipping” buttons or not in the customer account. As for the Notifications section, you should write a text for email notification sent to customers, a message for an RMA history, and email notification for admins (can be left blank). Each new condition requires a title, sort order, and status to be specified. 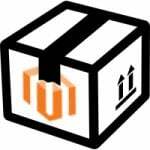 Besides, you can customize the way the Mirasvit RMA Magento extension works using workflow rules. You can add more rules to automate your daily RMA routine. Each new rule screen contains four tabs: General Information, Conditions, Actions, and Notifications. On the General Information tab, specify a rule name, priority, and status. Besides, choose whether further rule processing should be stopped. On the Conditions tab, choose the event for the new rule to be applied and specify additional conditions to be met. As for the Actions tab, you set status and an owner, as well as mark as resolved or unresolved here. On the Notifications tab, you choose whether to send emails to an RMA owner and a customer or not, specify additional email addresses, subject, and body, as well as decide whether to include files which were attached to the last message or not. It is also necessary to pay extra attention to the options available on the configuration screen. Here, you can fine-tune the Mirasvit RMA Magento extension with the help of the following categories of settings: General Settings, Customer Account, RMA Policy, RMA Number, Email Notification Settings, and Advanced Settings. 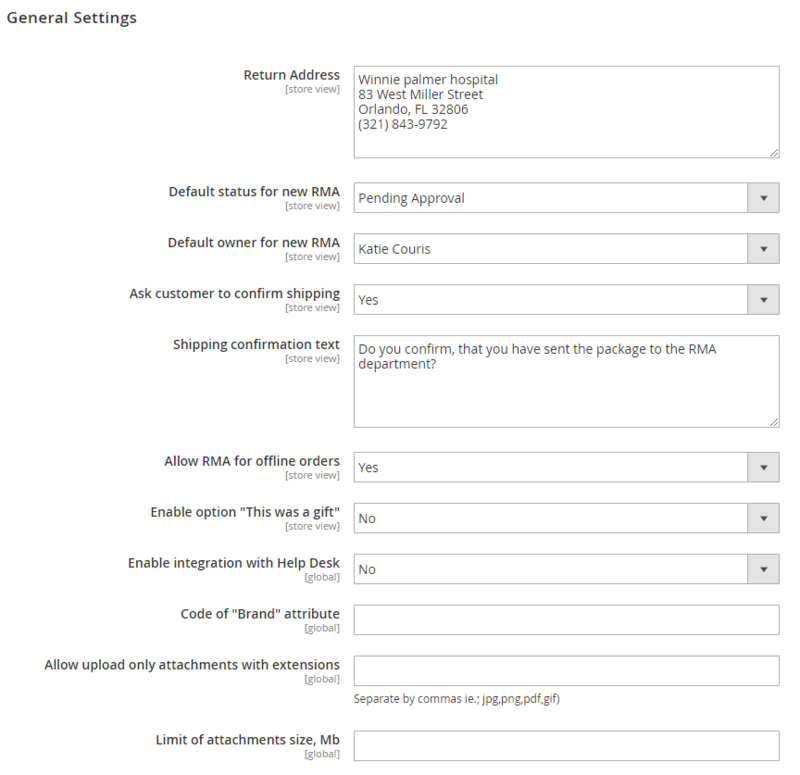 In case of General Settings, you specify your return address, default status and owner for new RMA; decide whether to ask customer to confirm shipping; leave a shipping confirmation text; enable or disable RMA for offline orders, the gift option and Help Desk integration; choose a code of a brand attribute; allow upload attachments with extensions, and limit the size of attachments. 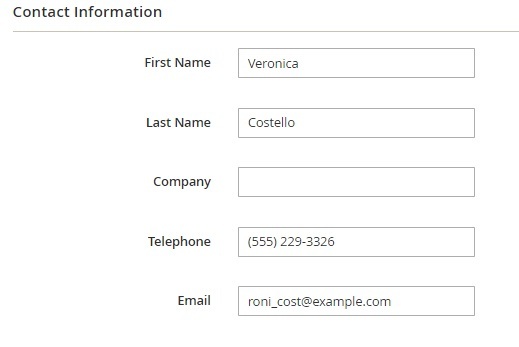 Customer Account settings let you show or hide the RMA section from a customer account, as well as display RMA to guest visitors when they enter an order number. 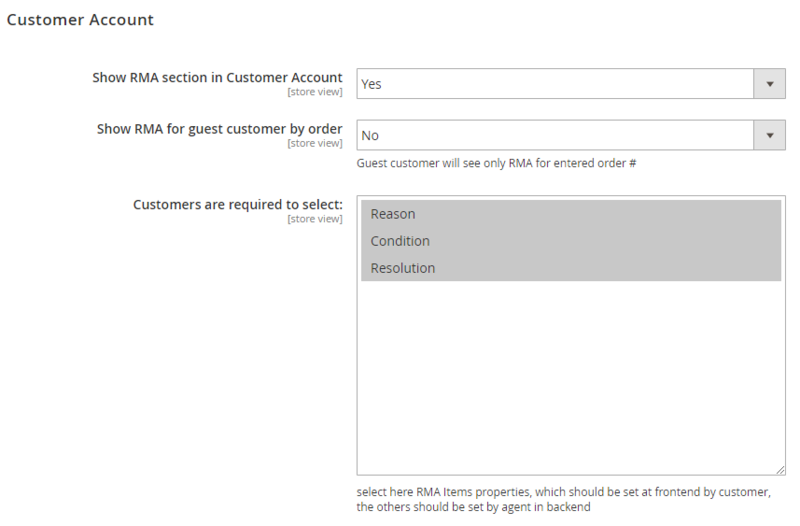 Besides, here you select RMA parameters that customers are required to submit. As for the RMA policy, you can specify the period after order completion when a customer can request the exchange. 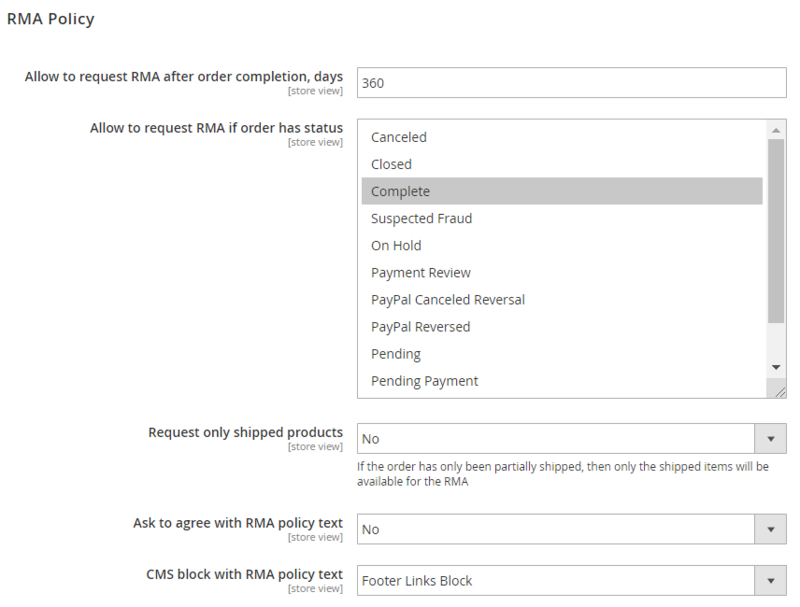 It is also possible to enable RMA for orders with selected statuses and shipped products only. Another option provides the ability to ask customers to agree with your RMA policy. Next, you can choose CMS block with RMA policy text. In RMA Number, you specify a number format, enable/disable resetting the counter for order, and insert the first number, counter increment step, and counter length. Email Notification Settings let you choose an email sender and templates to be used for customers, RMA owners, and rule notifications. Besides, you can decide where to send the blind carbon copy of all emails. In the last tab of the Mirasvit RMA extension’s configuration, you can force the module to apply its styles to the page. As you can see, the Mirasvit RMA extension for Magento 2 and 1 offers extremely flexible configuration so that you can deploy the module according to the needs of your ecommerce business. The tool even enables file attachments and customization of RMA appearance in a grid! Due to the advanced workflow rules, the extension easily fits any store business model. Mirasvit RMA lets you create rules that will help you control every step of returns and exchanges. As a result, this process becomes comfortable for both customers and admins. As for email notifications, they allow you to clarify and simplify your communication process. So, don’t hesitate to utilize highly customizable templates! For preventing frauds, the Mirasvit RMA extension offers Shipping Labels. You can upload and print PDF shipping labels of various carriers for both customers and admins. As for Reasons, Conditions, and Resolutions for customers’ RMA, they significantly simplify customer experience available with the extension by providing buyers with the option to choose among different conditions, reasons, and resolutions. Quick Responses are also among the most prominent features of the Mirasvit RMA extension for Magento 2 and 1. The module lets you reply to your clients rapidly. Consequently, buyers become more satisfied. Besides, with the Quick Responses templates, this boring routine turns into a piece of cake. Powerful reports are also among competitive advantages of Mirasvit RMA for Magento 2 and 1. The extension provides an excellent opportunity to analyze results at a glance. With such data as RMAs by status numbers, reasons, or attributes, total RMAs number, or total products returned number, you can easily understand what’s going on with your RMA routine. From the perspective of a customer, Mirasvit RMA looks as follows. On a customer account page, there is an RMA tab with all returns. As a customer, you can view both orders and returns. Each RMA page contains all the necessary data and features divided into the following sections: Request Information, Items RMA Requested for, Add Message, and RMA History. 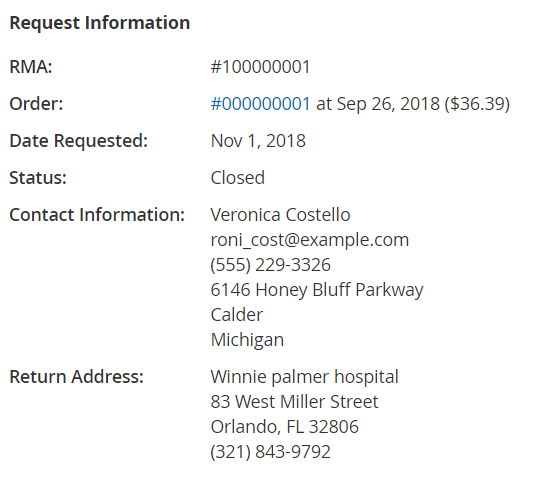 The Request Information section provides such data as an RMA number, order number, date, and price, date of the request, status, contact information, and return address. The second section contains data related to the product (name, color, size, SKU, and quantity) and RMA reason, condition, and resolution. Next, a customer can leave your message and attach files to it. Above we’ve shown how Mirasvit RMA looks for your customers. The interface is intuitive and very convenient, so RMA is no longer a problem for your buyers. Integration with helpdesk and RMA management features for customers (your buyers have a great opportunity to manage their returns as well as discuss exchange/replacement with the help desk). Availability for guest users (even guest users can discuss and add comments to their requests). 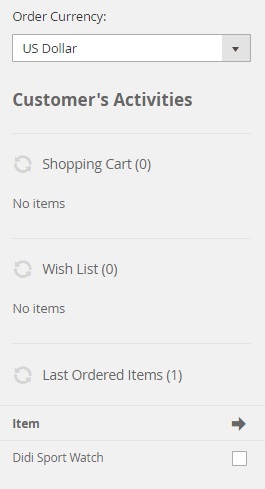 Customizable number of items to be returned (there is no need to return all purchased items; instead, it is possible to return only required ones). 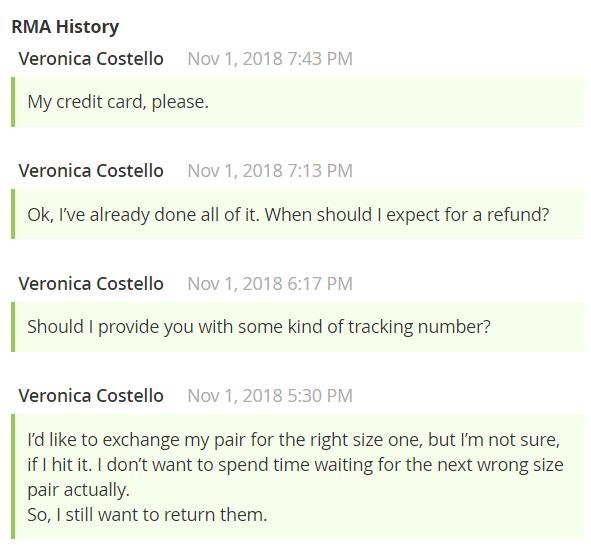 Refund (your customers can request a refund). Shipping labels (benefits from using shipping labels have been described above). 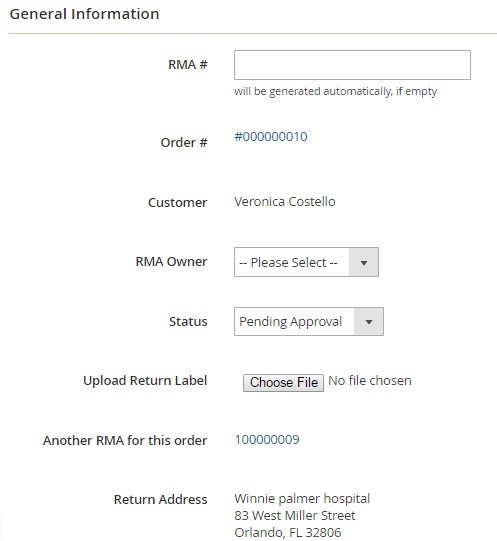 Administrators can participate in creating RMA orders (if a customer doesn’t know how to create an RMA order, admins can always help). Customizable messages to clients (a great feature for providing better customer experience). Quick responses (described above as well). 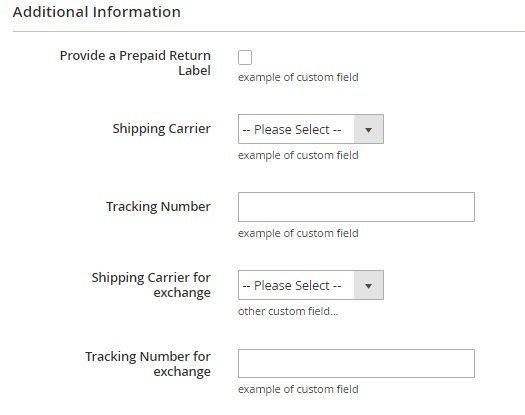 Custom fields for RMA orders (this feature also helps to create a better experience). RMA reports (you will always know how your RMA routine flows).